A couple of years ago on December 10, 2011, we did this post in response to the quandary that some have over Christmas. We’d like to re-post it again with some minor adjstments. May the Lord guide you into all truth. The whole Christmas season has been so commercialized, to the point that the vast majority around the world, find in it a reason for carnal celebrations. Most definitely leaving out the namesake–CHRISTmas. No wonder many Christians cannot in good conscience take part in this vast heathen experience! What I am going to translate into this post, in the following story, is the combining of Scripture, S.O.P (Spirit of Prophecy) and Shepherd’s Rod teachings on “Christmas”. So we may see a more encompassing ”big picture” of this important subject. This post is compiled with the vision of the Lord’s Glory and honor utmost in mind. We can never believe God gives His prophets or in this case prophetess light (truth) in which to guide the people, and then later another prophet comes and contradicts such light, teaching something totally opposite of what a prior prophetess of God has written in their inspired writings. Confusion would be the obvious result if such were the case. Instead of such confusion, can it be that Ellen White and Victor Houteff **, God’s last two prophets, together do indeed , shine light on a “honoring” Christmas, in a clear and understanding way? It is the day after thanksgiving, the famous “black Friday”. The heathens around the world are busy buying their gifts, most NEVER even dwelling on the “Christ” in Christmas. The Smiths are also out buying, however they are looking for nativity sets. You see they, as always, put up a nativity set in place of a Christmas tree. Their two small children love to help put up the display, remembering afresh, just what “Christmas” is all about–The Lord Jesus Christ. 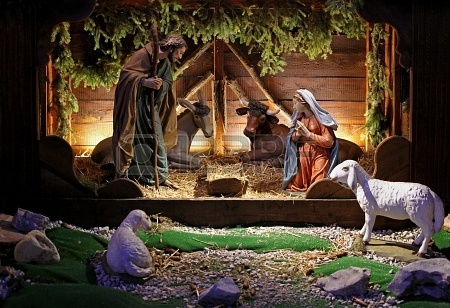 On Christmas morning, they gather around the nativity scene, with the holy music playing, the kids open the presents. After, the parents read the story of Christ’s birth from the book of Luke. The young ones listen attentively as their young minds imagine the baby Jesus story. Then they sing together Christmas songs. We are told in many inspired writings not to partake in heathen customs and practices. The tree for Christmas nowadays, is certainly symbolic of a heathen type of Christmas. Additionally ,(Jer. 10:1-5) clearly says that decorating a tree is a heathen custom. It is ALWAYS safer to be on the side of caution, than presumption. Personally speaking, I feel that the substituting a nativity set for a tree is a real home run, spiritually speaking. They CANNOT be faulted for this. Their motive most likely is one of warning the people not to DO as the heathen are doing all around, with all their customs. This post provides an additional perspective for those who choose to decide to honor and glorify our Lord during this season. 6) We have read that Ellen White has written many things about how Christmas can be kept, per the White Estate references http://www.whiteestate.org/issues/christmas.html#To Glorify God, Not Man. Yet, Victor Houteff seems to say –stay away from it. How do you reconcile these contradictions? Perhaps the best way is to read again the “Smith story”. I believe if Christmas is celebrated as shown by them, it does indeed honor and bring glory to our Lord. And keeping the true intentions of the Lord’s message through His prophets. In (1 Cor.10:31) we read “..whatsoever you do, do ALL to the glory of God.” Christmas certainly can be included in “all”. While we can give some Christ centered gifts to the young ones as their “presents”, we should encourage them to make birthday gifts for Jesus. They can do a painting, make a poem, make their own small nativity set or whatever their imaginations can stir up. The main thing is that they “made it” themselves. ** For those of you who are not aware of who Victor Houteff was, see our post “Has Elijah Come?” and “Who was Victor T. Houteff ?” under the heading–Elijah. This entry was posted on December 14, 2013 at 5:52 am and is filed under Christmas. You can follow any responses to this entry through the RSS 2.0 feed. You can leave a response, or trackback from your own site. Brethren,i am always of the feeling that the celebration has been largely molded by the heathen,that totally there is no thread of or semblance of Christianity in the whole exercise.Further more i have never known who were the originators of the celebration,and by the way,at times it is true that the veracity of some messages depends on the originators of the message.Paul gives us some help when he draws in our consciences in matters of the heart.Don’t you think finally even the Sunday rest can be accepted using such reasoning as you would want us agree?In other words we can rest on any other day and that what matters, is what goes on in our mind,so long as we are for Christ.Can you imagine the damage that can be done? Your points are valid ones which I most assuredly would like to address. On your first point “no thread or semblance of Christianity in the whole exercise”, for the vast Christian (and heathen) world this is very true. But do we see that truth apply to the Smiths? Can we honestly say that the Smiths have left Christ out of the holiday? On your second point about where it originated, as you say we are not sure 100%, there are MANY theories, so I cannot speculate here. On your third point about the reasoning given for the Smiths celebration to that of Sunday keeping, I find not a accurate one. First of all, we know from straight Biblical Scripture that the 7th day is the Commanded day of rest and worship. There is no guess work here. The Sunday keepers steadfastly ignore this in there Sunday day of rest. But as you see from the above post, our founder of the SDA church said the following, “Christmas is celebrated to commemorate Christ’s birth.” So here we have instructions that the day is for a higher purpose. No where in all her writing does she condemn the “proper” keeping of Christmas. We should understand that people such as the Smiths are not under that condemnation because they do indeed “honor the Saviour” and take NO PART in the heathen custom to gratify their carnal hearts. In fact they have turned the whole custom on it’s head! Again, the words, “For he who is not against us, is for us”. Can the Smiths be seen against Christ and His honor during the season? On the contrary they are instructing their little ones to “love and honor” the King in a special way. Lastly, as mentioned in the post, I do not fault you or others on any stance for not wanting to celebrate Christmas. Your motive , as I see it, is one of trying to do “right” by the Lord and also to not dis-please Him as you understand the situation. This is well understood and respected.